No, it was never going to be the tight-checking and wait-for-the-first mistake battle it was in late-September when Atletico Madrid hosted Chelsea at the Wanda Metropolitano. Atleti’s do or die circumstances had a profound impact on the way this game, at Stamford Bridge, was going to turn out. Sure, the Champions League group stage meeting in Madrid between both sides was an end-to-end affair at times, but, tactically, this match was a bit more interesting for one reason: Atletico needed to extend themselves more and commit more bodies forward. Why? Because their chances of qualifying for the knockout stages rested on this match. They needed a win. This, of course, was no bother to Antonio Conte. The Italian manager, while having a successful tenure at Juventus, proved his counter-attacking and build-up structure at Euro 2016 with Italy, and soon after came to England to take the 16/17 Premier League crown. A large part of Chelsea’s success last season was down to defensive organization and how to transition well from defense to attack. Atletico’s dire situation and need to score goals, plus Chelsea’s characteristics mentioned above, was always going to make this match a must-see for tactic lovers. And, it didn’t disappoint. These narratives aside, Atletico Madrid supporters are hurting. As it happened, the match finished in a 1-1 draw with Chelsea knocking Los Rojiblancos out of the Champions League, but their seven points may see them qualify for the knockout stages of the Europa League. 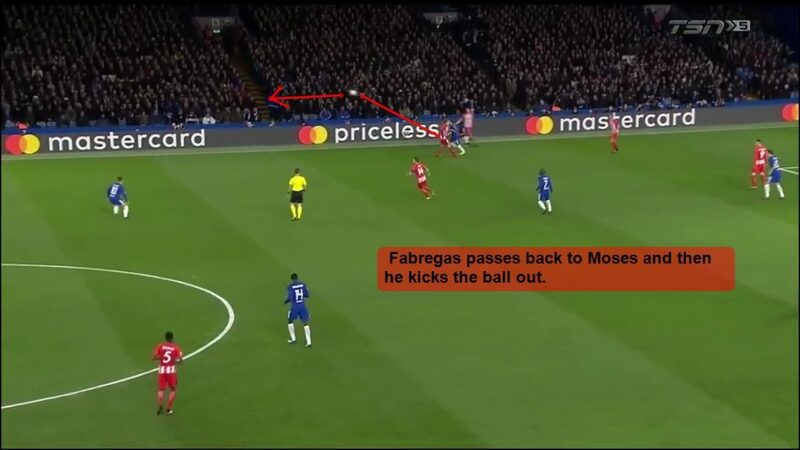 Anyhow, before we analyze how this match played out at Stamford Bridge, tactically. Let’s briefly analyze the basic approach of both Diego Simeone and Conte from the first group stage meeting and we’ll compare later if anything changed, drastically. Given that Atletico were home, it’s quite common to see them play on the front foot, high-press, and then look to quickly and directly snag a goal. They do this because, hypothetically, at 1-0, Atleti really enjoy sitting back and playing off the counter or off transitions from defense to attack. That is their bread and butter, and against Chelsea, it was no different at the Metropolitano. How do they usually try to achieve this? Well, unless it is against inferior opposition, they’ll likely extend themselves a bit more and commit more bodies forward. Despite their ‘defensive’ reputation, Atleti are quite good at keeping possession of the ball, but they struggle at scoring via a positional play style. 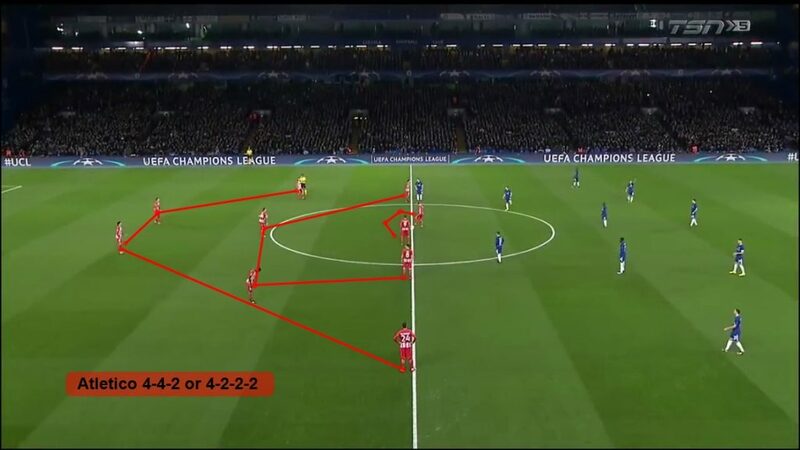 However, against tough teams like Chelsea, they structure their attack in a particular way. Below, we see Simeone’s side implement a triangle overload down their left side (Chelsea’s right). 1. They like to overload down Filipe Luis’ flank due to the Brazilian being excellent at dribbling in and around tight spaces (overloads, of course, will be limited in space). 2. A lot of Atletico’s attack relies on individual flare. So, this overload can draw Chelsea to one side in hopes Antoine Griezmann can have more space in or around the penalty area. Best case scenario, this triangle overload pulls Chelsea out of position for one of Atleti’s flank players to directly provide a low-cross to Griezmann or someone else. 3. In the screenshot above, notice how Thomas Partey and Koke are in midfield. Partey in the left half-space and Koke in the central axis. These two are close to the overload, but not too close. They have a reactive, multilayered purpose in their positioning. They’re there to help switch the play to the right side if needed, help the counter-press if pressure can be applied correctly when Atleti loses the ball, and quickly be able to track back and help Atleti reorganize the defensive block if they can’t win the ball back. 4. Lastly, four other Atletico players (not seen in the screenshot above) are behind Partey and Koke. This means Atleti are in a direct and non-risk taking attacking structure. If they do want to lose the ball, they’d rather it be on the wings, away from the central areas, and with some decent cover behind the central midfielders. Atleti will rarely push both full-backs high up at the same time. Now, how did Chelsea defend this? Well, per usual, they defended in a 5-3-2. 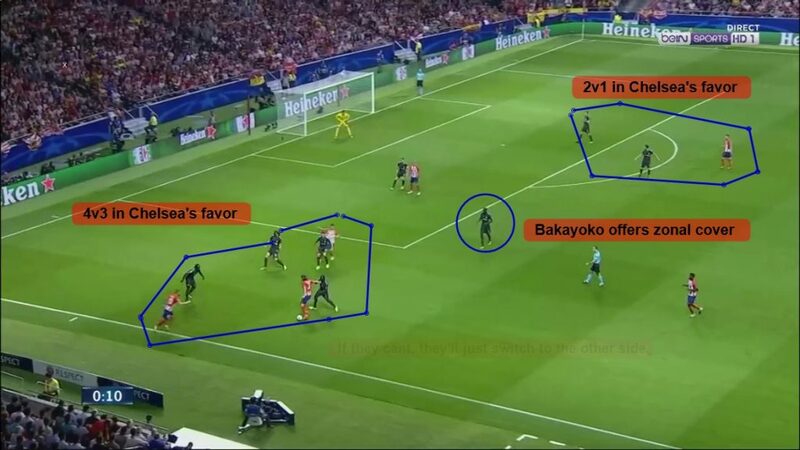 Now, as for Atleti’s triangle overloads, Chelsea looked to create as many man-up situations with at least one defensive midfielder, in this case, Tiemoue Bakayoko, covering the space between the overloaded and underloaded sides. That is how they dealt with it for the most part. Have a look below. Of course, given that Chelsea are one of the best defensive sides in the world, it was hard for Atletico to find chances, and at Stamford Bridge, it was much of the same. But, despite both matches having similarities, Atletico’s desperation to qualify and score goals made for some notable changes. Now, both sides pretty much approached the match in the same two formations: a 5-3-2/3-5-2 for Chelsea and a 4-4-2/4-2-2-2 for Atletico. Atletico, again, given their dire circumstances, opted to high-press Chelsea to try and force a turnover in the attacking half or disrupt Chelsea’s build up. They used a very fluid 4-2-2-2 or 4-3-3 and actually laid down some nice 5v5 sideline traps early on. Below, we see Atletico’s high-press beginning to take shape. Above, we see that Davide Zappacosta is passing backward to Thibaut Courtois. Next, as Courtois is about to settle the ball, we see that Atleti go man-to-man with Gabi, Fernando Torres, and Koke anticipating that Courtois will pass to Chelsea’s right side. With the play developing further, Koke (red circle) pushes up higher on Cesar Azpilicueta (blue circle) as it looks like Courtois will pass to that side. 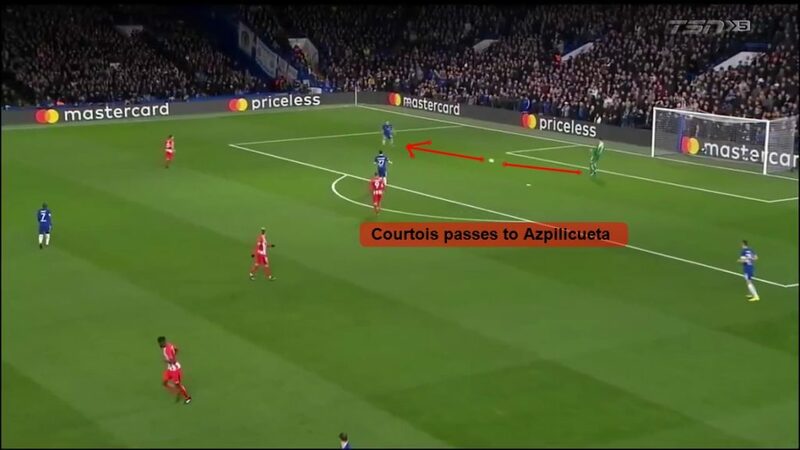 As it happened, Courtois does pass to Azpilicueta and that will trigger Koke to close down time and space more aggressively. With Azpilicueta moving forward, Koke presses and Atleti form a sort of 4-3-3 with Griezmann staying more zonal, centrally, waiting to press Gary Cahill if need be. 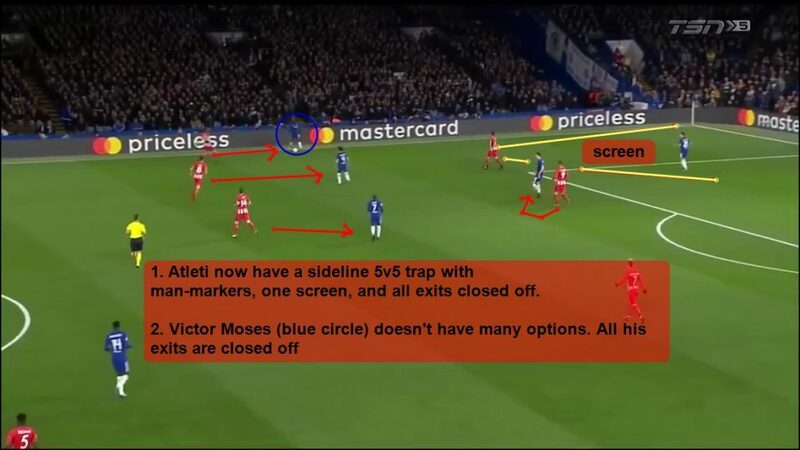 Next, Azpilicueta passes to wing-back Victor Moses which then triggers Atletico’s 5v5 sideline trap. As you can see, Atleti have matched 5v5 along Chelsea’s right-sided touchline and are now going to close off all exits. Moses has no options with Atleti man-marking and screening off his outlet passing options. 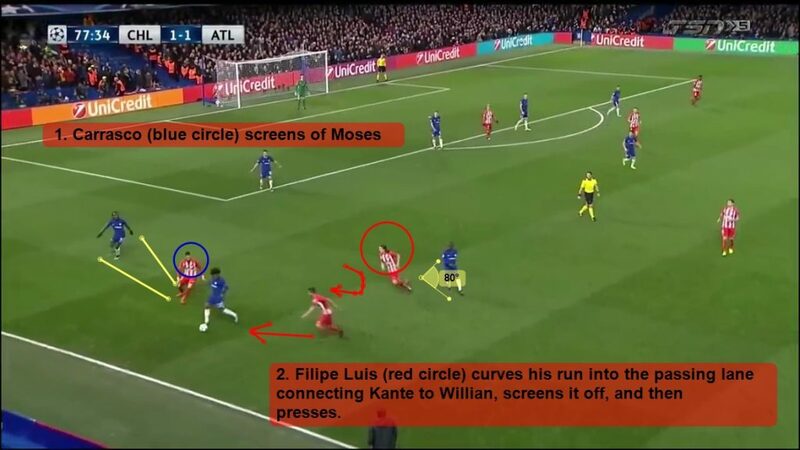 Lastly, Moses is forced to kick the ball out; successful press for Atletico. 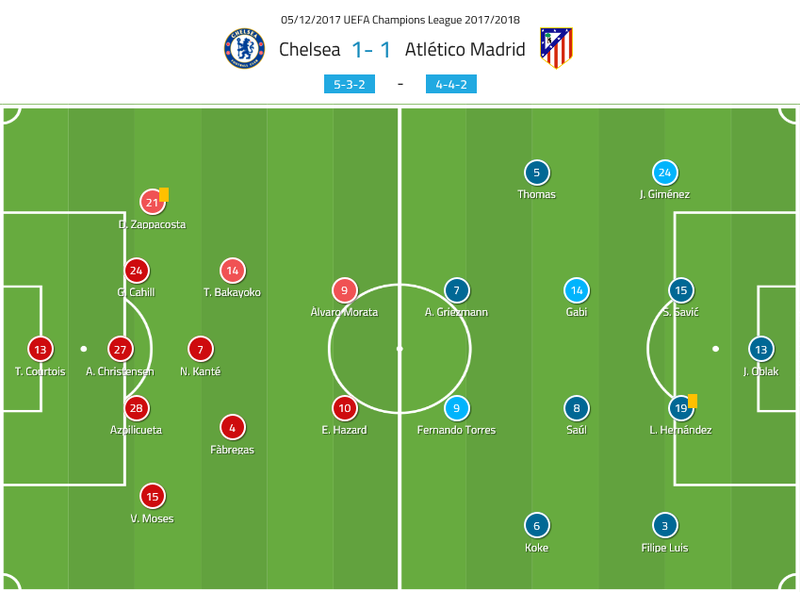 Now, with this phase of play digested, it needs to be noted that Chelsea played the first-half quite defensive, but they also did manage to create many chances, most on counters, but they also did beat Atleti’s press on many occasions. However, given that we mentioned Atleti’s more cautious attacking structure from the match at the Metropolitano, we must analyze how Simeone’s side changed their attacking pattern and strategy under desperate circumstances. It’s important because it helped Chelsea create more chances on counters. As we mentioned before, Atletico’s attacking structure from the first group stage meeting was more cautious. Let’s have a look again. Now, let’s look at another Atleti left-side overload with Filipe Luis on the ball from Tuesday’s match. As we can see, above, Atleti have committed way more bodies forward in a very rigid 2-3-5 formation. Partey, too, is also out of frame but is on the right wing in more of a forward position. Furthermore, below, we see just how disconnected Atleti’s CBs were from their own midfield. By Atletico Madrid standards, this is rare and it proves just how desperate they were to score first so they could play the rest of the match in their more comfortable mid and low-blocks. Also, below, we see a very uncommon thing for Atleti: both full-backs (red circles) higher up with Griezmann (blue circle) high up and disconnected out wide. 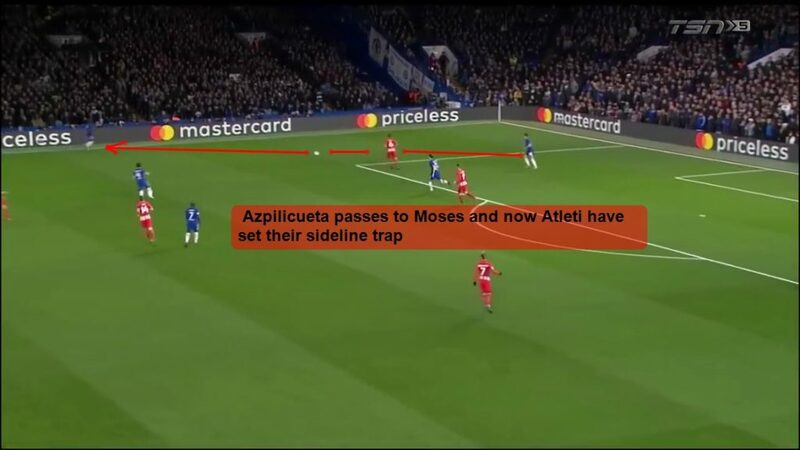 With that said, this obviously played into Conte’s hands as he knew, given Atleti’s risky shape, that despite his side sitting very deep and negative, it was okay because the opponent was going to be giving up a lot of space for his forwards, especially Alvaro Morata. Below, we can see Chelsea’s 5-4-1 low-block with Eden Hazard very much a part of the defensive effort and Morata disconnected up top. Now, Morata on certain occasions did join the defensive front and screened off passing lanes into central areas. As we can see below, he’s screening off an easy passing lane to Saul Niguez. 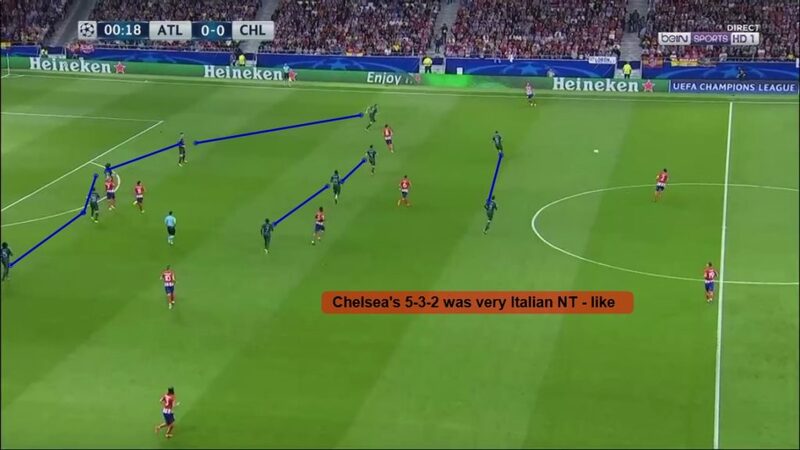 But, given how disconnected Atleti’s CBs were from their midfielders, Morata also stayed high up to give Chelsea more of a 5-3-1-1 formation. With Atleti’s open and risky attacking structure, Hazard had more potential space to dribble and Morata was going to put the pressure on the opposing CBs. The first-half finished with Los Rojiblancos enjoying more of the ball but Chelsea creating more chances due to their dynamic midfield, Morata’s excellent touch in tight spaces, and Hazard’s dribbling. However, as it happened, Atletico would take the lead after Torres would flick over a set-piece assisted ball to Saul who then headed it past Courtois at the 56th-minute mark. But it wouldn’t last. About ten minutes later, Pedro would come on and the Spaniard was breaking lines and winning his 1v1s and 1v2s. Chelsea, who were now more expansive, were playing the type of football where the Spaniard flourishes in: quick and direct possession football. At this point, for the most part, Atletico ditched their high-press. With Courtois about to settle the ball, Koke and Griezmann signaled to their on-field teammates to drop off the press. Next, Courtois passes to Cahill and Atleti drop off and go into a compact zonal block with very little pressing or screens. Lastly, they go into a very deep 4-5-1. However, despite this defensive change by Atleti, you could feel an equalizer coming and it did. Hazard would soon find himself crashing Atleti’s penalty area and firing off a shot that clipped off Stefan Savic for an own goal at the 75th minute. With Atleti on the ropes and the game tied at 1-1, Chelsea kept putting on the pressure; Simeone’s side high-pressed when they could and had the energy, but they ultimately got overrun on numerous occasions. Counter-pressing is a very important phase of play due to the fact that it structures your players to react in a certain way to optimize your chances of winning the ball back quickly. The counter-press below is a great example for coaches to recreate in training because of the fact it’s a clean 3v3 (4v4 if you want to include a forward dropping deep to help) near the sideline. As many of you may or may not know, counter-pressing is at it’s easiest when near the touchline. 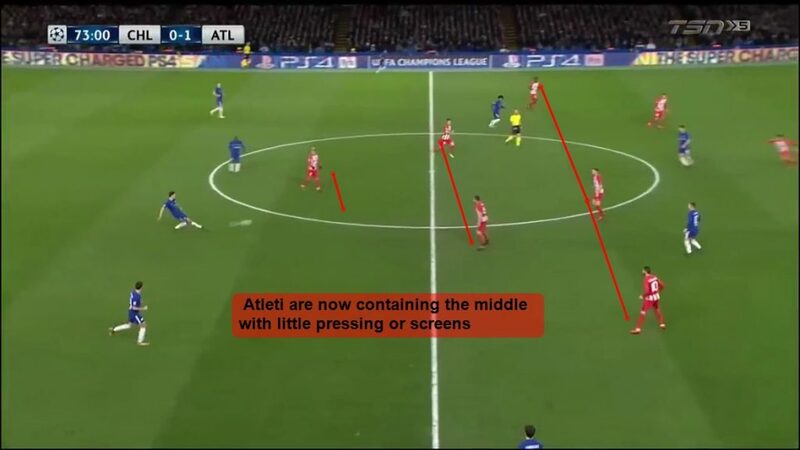 So, below, we see Atleti working Chelsea’s right side. As it happened, Yannick Carrasco passes it to Filipe Luis and it is intercepted by N’golo Kante. Below, we see Willian winning the loose ball and beginning to turn forward which, in turn, triggers Atletico’s counter-press. Above, we can see Carrasco tracking Willian from behind, but also moving horizontally to screen off Moses’ passing lane. 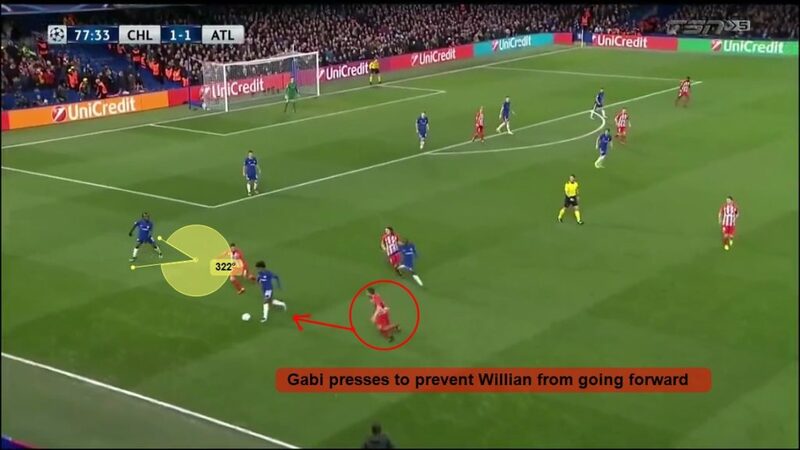 Next, we see Gabi pressing from the front, Filipe Luis curving his run to cancel out Kante’s passing lane to Willian, and Carrasco closing off all exits as well. Lastly, below, we see that Willian has no near exits to pass for help and must chip the ball up to one of his dropping forwards, but the ball then goes out of play. Of course, every manager would prefer their side to use the counter-press to win the ball back quickly so they can quickly transition to attack on a defense that likely won’t be organized due to the fact they just lost the ball. But, it’s still good to disrupt the opponent from building-up. The scenario is great because, as we said earlier, it’s a 3v3 near the sideline and it is a common situation. You want your players to identify the scenario and react well to it. In the end, Chelsea’s individual attacking quality came through and exposed Atletico, especially in the second-half. These two sides make for interesting matches because they are both filled with quality, tactical versatility, and they’re both almost impossible to score on once their low-blocks are organized. However, Chelsea just gets the edge over Atletico due to their individual attacking flair and their ability to always find ways to score. Although the London side wasn’t at their most clinical, and the match should have finished with a higher score in their favor, I don’t think any side wants to face Chelsea.